With March Break this month and three additional days off school, I was with my littles quite a lot this month! We had many moments of snuggling up with our favourite books, but also a lot of time spent out and about, so I'm not sure if I had extra time or less than usual time this month to actually read. I guess we'll see based on what I finished this month! This was a long biography that I listened to on Christian Audio and was able to knock back thanks to a March Break drive to and from Ontario. The kids, knowing who C S Lewis is, didn't mind it on in the background of our drive, though I doubt they enjoyed it nearly as much as I did. It was very detailed covering the world and British history around his life (Irish politics, WWI, etc. ), his personal life, and his works. I loved hearing about his relationship with J R R Tolkein so much that ti spurred me to give The Lord Of The Rings a second try. When I first watched the movies ten years ago I was heavily pregnant with Lily and not interested at all. I was couch-bound so Brad asked me to give them a go, since he loves them so. Well, at the time I hated them - too violent! not my genre! too medieval! All I can say is if this biography did nothing else, it opened the door to LOTR and for that I'm thankful. I'll aim to read LOTR this summer, but it's all thanks to the impressive life of C S Lewis and this biography that primed me. Seriously though, Lewis was a fascinating man who I very much respect and I loved reading about his life in more detail. I read this simultaneously with Oli, and I don't mind saying he finished before I did! As I was finishing he also finished Jo's Boys which I'll be reading most of this month and probably won't finish until next month. You know when you read a great book and grieve that it's over? That was me after Little Women last month, and lo and behold, Little Men was the perfect cure. I love seeing Jo grow up to be a mother and headmistress of Plumfield School For Boys (and later Girls too!). Back in January, I said Marmee was Mom Goals, but I need to add that Jo, or Mother Beahr, absolutely is too. This book is full of harsh realities, faithful friendship, and saccharine hope. I usually don't like a book of just one or two of these themes, but all three together is perfection. Alcott's writing is lovely but she never shies away from hard themes such as poverty and death. I think the best children's literature faces these realities with care for their reader, but faces them nonetheless. I guess that's why Louisa May Alcott is one of the greats in children's literature! I finished this with tears streaming down my face while the kids were at tennis one Saturday and was so wrapped up in the book world that I didn't realize how I probably looked (comepletely distraught), until a kind fellow parent asked, Madame, Ça va? Oh yes, just a great book, haha! This was one of the Daily Deals on Audible so I grabbed it this month when I saw it on sale for under $5 (remember, most audiobooks are over $30 normally so this is a huge way to save). 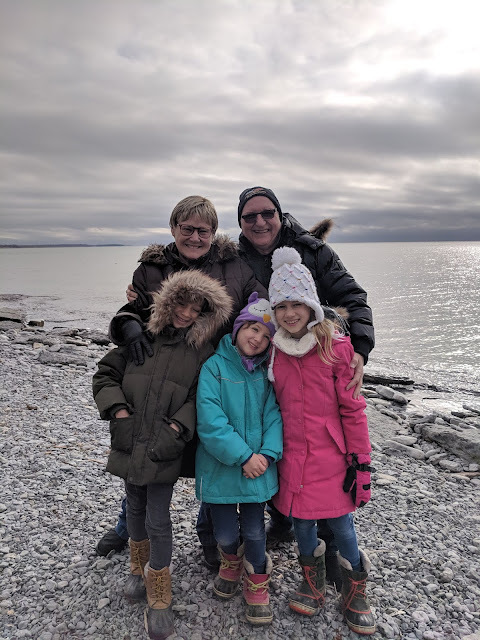 Our first big trip as a family of five was to Copenhagen if you recall, and Denmark left a beautiful impression on us as an extremely beautiful, modern, and family-friendly place. Having been to Denmark and loving this sort of book in general (those here's-what-I-learned told from the first person and delving into culture sorts), I really enjoyed this book. It's narrated beautifully but at times was a little drawn out. If you have read French Women Don't Get Fat or Bringing Up Bebe, it's similar to those (and I loved those both as well!). This month I was lucky enough to receive some gifted books from The Good Book Company, one of the publishers I read the most. 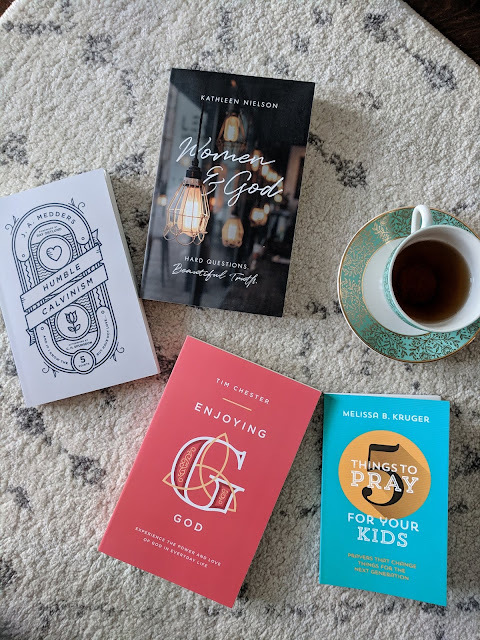 The other books pictured above were also from The Good Book Company and I'm still working through those, so keep an eye out for those summaries in the months to come. Melissa Kruger is one of my favourite TGC ladies, having listened to her speak many times and enjoyed countless articles of hers over there. It is concise and to the point (perfect for a busy parent) and very helpful. If you ever struggle to pray authentically and purposefully with and for your children, this book will help you and not overwhelm you. I pray with my kids on the way to school each morning, before every meal, and before bed, but still I fall into rote prayers sometimes. This book reminded me of the many things I could be intentionally praying for and has enriched my prayer life! I also really loved how it was a small book and quick read. A busy mom's dream! I'm always so curious to find out what names for grandparents other families use. How did you come up with the names, who chose them, and which names stuck (kids are notorious for nicknaming grandparents I've learned!)? When I was pregnant with Lily we put it to the grandparents (all six of them in our case). What would they like to be called? I had my hidden hopes, but ultimately I do believe it's the decision of the grandparents to choose the name they'll be called. I think that's what I'll want if the day comes when I have grandchildren, so it seems fair. Plus we already get to choose baby's name. Ultimately, it feels like a way to honour our parents and give them that power as they step into a new role as well. My parents began as Grandma and Grandpa - the names we grew up using for my dad's parents. I liked the familiarity, but it didn't stick. 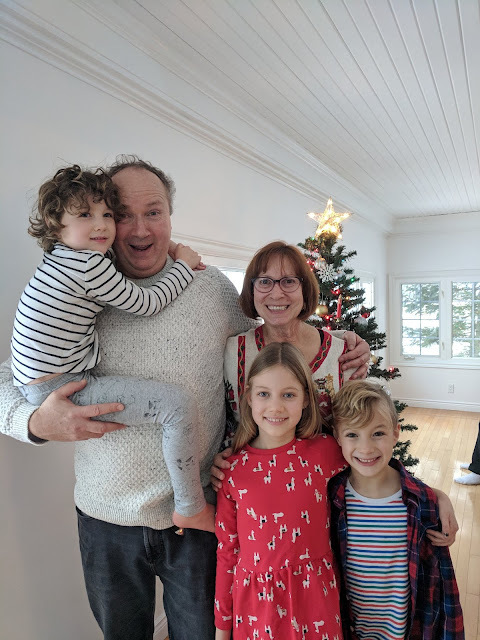 Before long my dad was being called Papa by the kids and so it stuck, and then when my sister's kids started talking, my niece started calling my mom Mimi, thus Grandma and Grandpa became Papa and Mimi. Brad's mom and her husband Bruce created their names - Granna and Papa Bo (B O for his initials) and they've stayed the same ever since. Brad's dad and his wife Deb chose the names Papa and Nana Deb, but my father-in-law became Papa Jim (because they kept saying "Papa what?" to match Nana Deb). 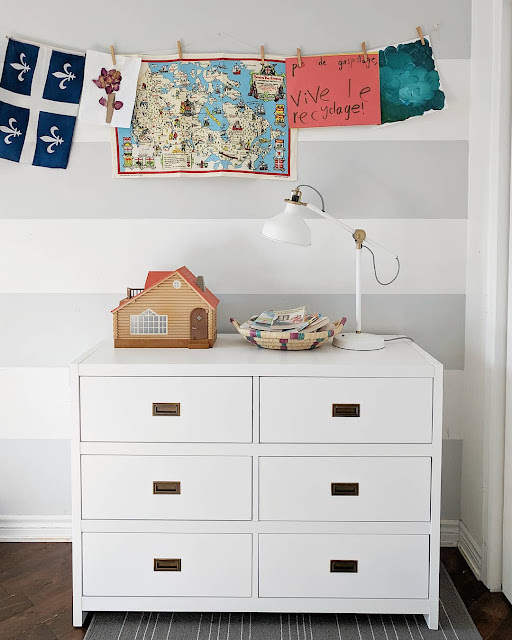 As one of the only Quebec retailers that carries some of my favourite European brands, and often marked down to up to 50% off, Lou Wolf is certainly a must mention in my SHOP QUEBEC series. I first discovered Lou Wolf online, but later learned that it's a local business, based in my own neighbourhood! 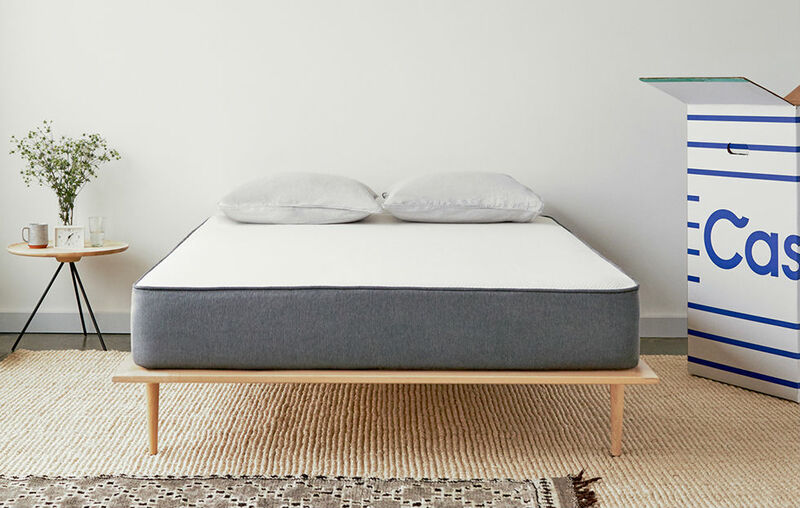 Run completely from their Plateau Condo, Lou Wolf carries pieces which are not only playful and unique but extremely high quality and ethically made. Oli in a Whistle & Flute, Lily in Hugo Loves Tiki, and Clover in Mini Rodini, all from Lou Wolf. Most of the brands are difficult if not impossible to find in shops in Canada, but I recognize from our trips to Europe. The thing with these admirable brands is that they're often way beyond our budget, but that's why I am especially fond of Lou Wolf - they have insane sales!! Every day in Instagram stories, Lou Wolf posts a few pieces that they'll offer at a deep discount for one day only. We're talking Mini Rodini, Hugo Loves Tiki, Huxbaby; often at almost half their retail value. They ship everywhere (I've already had Instagram followers let me know they've ordered from all over the USA), but local shoppers will have their packages delivered by bike messenger. Swoon! Their packaging is eco-friendly too. Check out this fun kid's shop on Instagram and online! 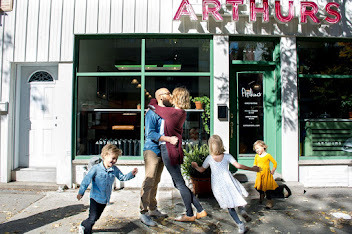 a shop I love for my own children. As suspected, I didn't have as much time to read this month as I did in January (I miss you Christmas holidays! ), so I finished fewer books than last month, but some gems nonetheless! This book was such a pleasure. It was a very light read - one you can pick up out of nowhere and get into easily - but still transported you to the world of the author, which I think only the best books do well. I felt like I was in Provence as I read this book, and boy do I long to go back after having finished it. We have actually been to the exact place Mayle writes of (Aix-en-Provence in the Luberon Region) and it's exactly as splendid as he describes. The author is British so two fancies were met in one book for this French-living Anglophile. He compared their southern French life to that of busy London, and writes like a true Brit, so I obviously enjoyed those aspects immensely, but how he writes of France you can't help but fall in love with the food, the customs (even the frustrating ones! ), the language, in short, all things French. He has several other books about their years in Provence and I can't wait to get my hands on them in due course. This was a natural followup from last month's The Livegiving Home by the same author, and I enjoyed it just as much. It's not a deep theological read, it's lifestyle meets hospitality meets recipes meets encouragement from the word. 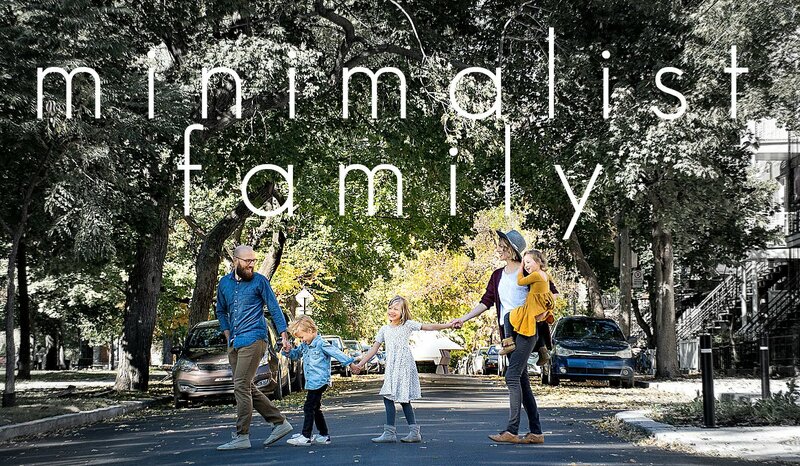 A really lovely read and really spurred me on in setting the table of fellowship and discipleship before my children, friends, and neighbours. Clarkson says again and again, "it's not what's on the table, it's what happens at the table" to remind us that it's not about homemade bread or a perfectly laid table (though those things are wonderful and add beauty and comfort to our lives!) 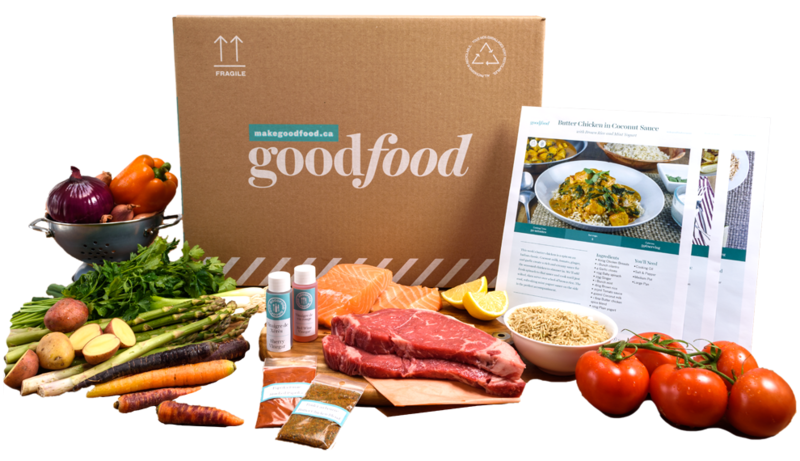 but about making the most of mealtimes and using food and drink to bring merriment and welcome. I've wanted to read this books for a very long time after having heard countless historical Christians state it as one of the most influential books in their lives. Queen Elizabeth II says it opened her eyes to true religion and read it to the world on her first Christmas Broadcast. Charles Spurgeon gave it away liberally, including to his wife Susie, who credits it as having won her to Jesus. It was written in 1675 and is one of the most published books in history, and still today I have to say, it's a treasure. 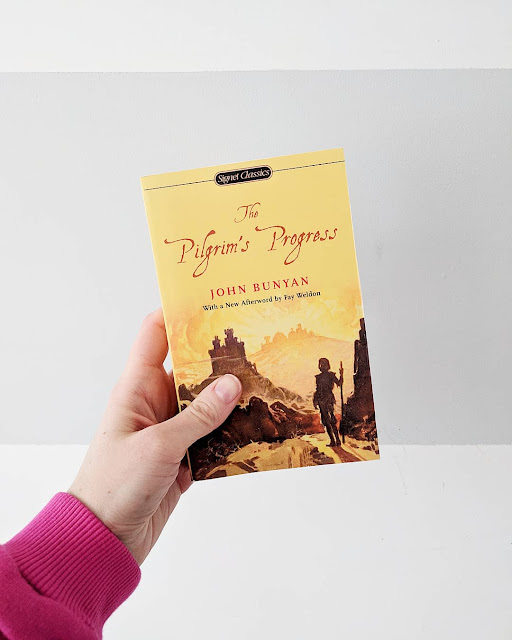 The story of Pilgrim, later named Christian, as he journeys to the celestial city encountering all numbers of snairs and evils on the way is an allegory for the Christian life. It's poetic and pointed and goes to show how there really is nothing new under the sun. The same challenges we face today, at their core, were the same 350 years ago, and long before that. I listened to this book on Christian Audio and delighted in every word! I will say it was a bit hard to follow at times if I wasn't giving the audiobook my full attention. I highly recommend the audiobook over the paper copy simply because there are so many characters to keep track of, and the performer does a great job giving them all distinct voices to help you differentiate. With three kids to a room I have a lot of trouble keeping EVERYTHING minimal. 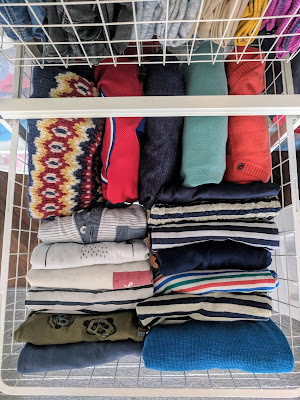 Without the space for various dressers, we put everything in their shared closet and keep capsule wardrobes. Without the space for three beds, we use the triple bunk leaving the footprint of just one. But when it comes to art work and curiosities, I am sometimes at a loss. They come home from school with handfuls of art weekly and we seem to continually be collecting little trinkets that are "so special" to them. Keeping these in order and deciding what to keep has been a continuous learning process and work in progress, but we have developed a few systems that help a lot! With art, we take digital copies of things they really like and then recycle them. Pieces the kids really love get hung on the wall in their room for a week or so and then we swap them out for the next batch of art.The very rare piece that we all love and attach meaning to might be framed, maybe. 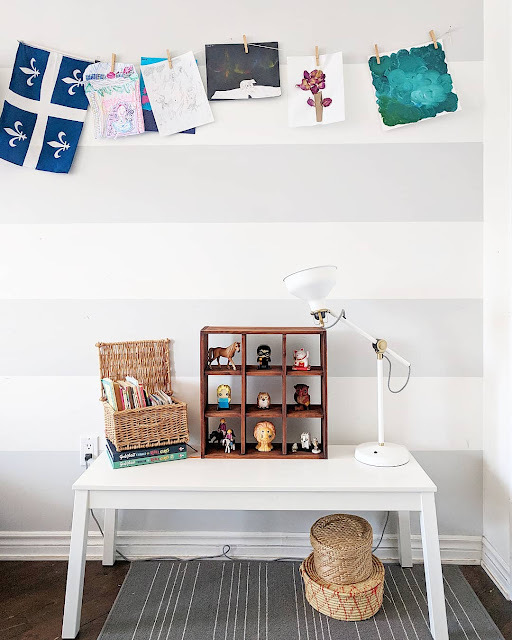 With a small rope to hang art on, they can see the limited space and don't insist on keeping everything. Minimalism in a larger home would be a challenge because you don't have the built in excuse that we did: we simply don't have the room! With little trinkets, models, figurines, etc, we needed a plan because I swear ours were mating! 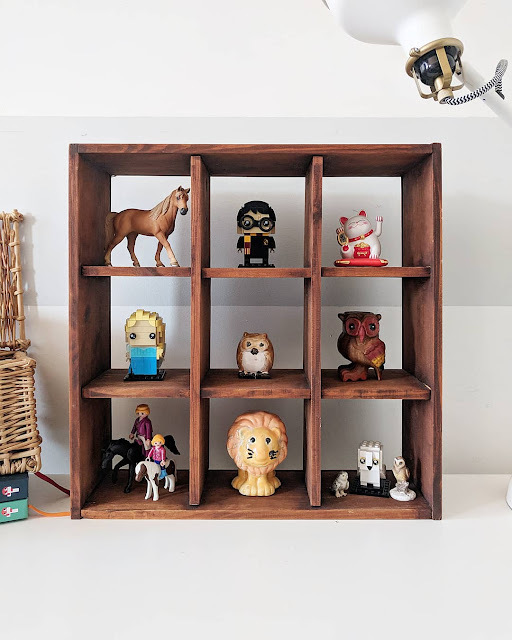 Especially when one of our kid's has a particular interest such as Lily right now with horses and Chloe with owls, penguins, and cats, those figurines hold special value. In the past I might have been more cut throat with their little curiosities as their interests changes with the weather, but at my kid's ages (5.5, 7.5, 8.5) they are maintaining interests for longer seasons now (years!) so I want to value them out of respect for them. 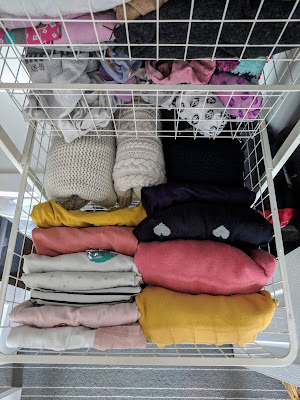 Having a set spot for things you're going to store really helps things stay minimal, because in theory, as the space runs out, the things must stop coming (or be traded for new things). With the help of the kids, I decided on a random number of stuffed animals last year, so every time the kids want a new stuffed animal (basically every visit to a thrift store this comes up!) they have to decide if they want it enough to replace one they already have. We don't just add on to infinity, we swap out, donate, and maintain the same numbers. Same goes with trinkets. Now that I have this little shelf, they know they can fill it with special things in their three shelves each, but they will need to donate something to make room for new items if at some point they have the hankering. The shelf was a thrifted find for under $4 and I love how it limits what we keep, while still valuing their little collections of special things. As I mentioned in a post last month, I've been keen to make Instagram worth my while and as such have stopped following loads of accounts that either made me feel frustrated, left me playing the comparison game, or didn't spur me on. I'm not saying all of life needs to be this way. In real life, there are hard people we need to love and bear with and stick by. Relationships take work and aren't easy. But this is an app, people. It's supposed to serve us, or it's not worth our time. 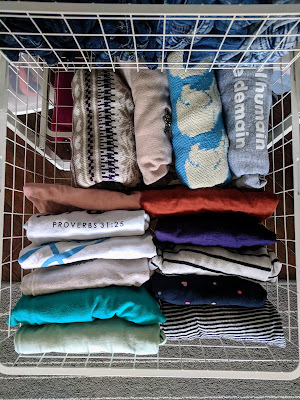 I've been a life long thrifter, but I realized I didn't follow many people on Instagram who build their wardrobes and beautify their homes by shopping secondhand. So, last week I set out to find them. By searching a few thrift-centric hashtags I found a truly lovely group of ladies, and in keeping with my idea that Instagram needs to be interactive to be worthwhile, I reached out to all of them! The odd account didn't get back to me, but the vast majority wrote back with enthusiasm and since then we've been messaging one another and enjoying one another's accounts. I think we need to follow people that encourage and inspire us, but I realized I had been following one too many accounts with designer outfits and high end homes for my liking. This is personal, and you may not be like me, but I do find I'm influenced by the things I see and hear. Following more local and affinity accounts has helped me take back the 'gram in a sense. I'm looking for more Montreal accounts, more Canadian accounts, more accounts by women doing hard things, serving God, investing joyfully in their families, getting courageous in the kitchen, reading rich literature, and creating lovely homes from secondhand treasures. Almost no account covers all of these affinities, but any one of these topics is what excites me and makes the app fun again. Here are the women I've started following recently in the thrifting category. Check them out! We've all watched the show, read the book, seen the memes, and heard the phrase "spark joy", but have you attempted the folding techniques? I hadn't! 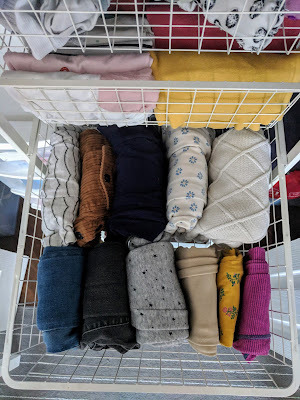 I've been purging items as a self-proclaimed minimalist for the last three years or so, so when Marie Kindo came on the scene, it was more been-there-done-that than life-changing, but recently I employed her folding techniques not only for my own drawers but also for my three kids' shared closet and I have to say, it's glorious! After only keeping clothing that you truly love and wear, you still may have cluttered drawers. 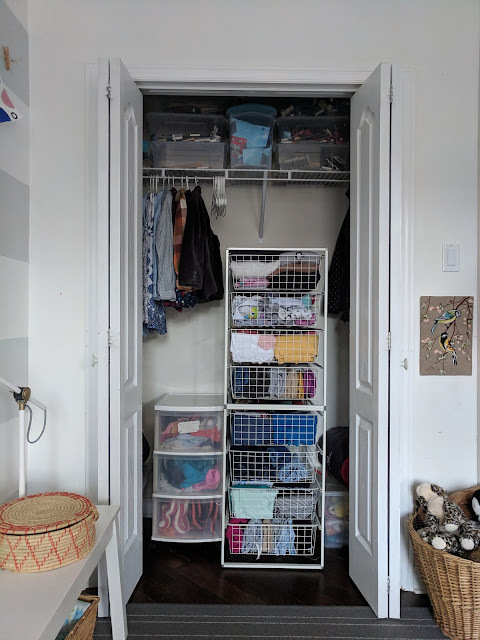 In our case, it's not because we own too many items (read more about our kid's capsule wardrobes here), but because we have very limited storage space. 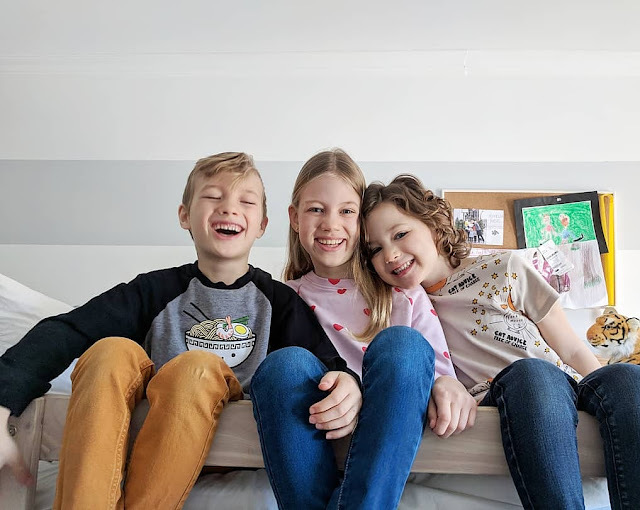 With three kids in one bedroom, sharing one closet (and no other clothing storage such as a dresser), even our petite wardrobes feel chaotic sometimes. 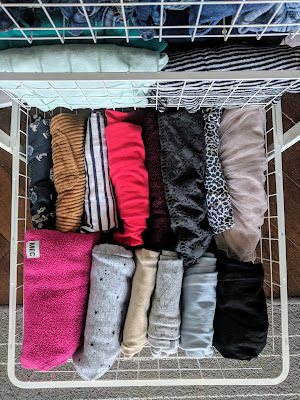 Last week I tried Marie Kondo's folding style to display every piece of clothing and not only did it save a ton of space, but it's also made choosing outfits a breeze. 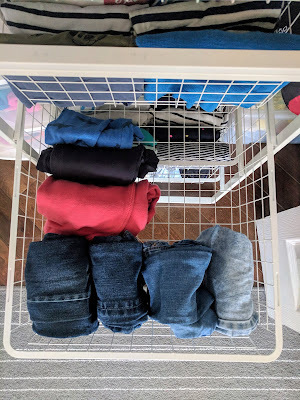 My kids typically grab the tops and bottoms on the top of the piles in their drawers, so they cycle through the same three outfits (basically the amount of time it takes dirty clothes to be cleaned and returned) unless I intervene. I was so frustrated that my favourite pieces they own wouldn't be worn, and sometimes outgrown before much use. The folding solves that! I found the kid's bottoms in particular took up so little of their drawer space with this new folding style that for the girls I was able to incorporate their dresses and skirts too (except the dressier pieces that I didn't want to wrinkle), leaving a ton of extra hanging space for out of season outerwear, halloween costumes, etc. 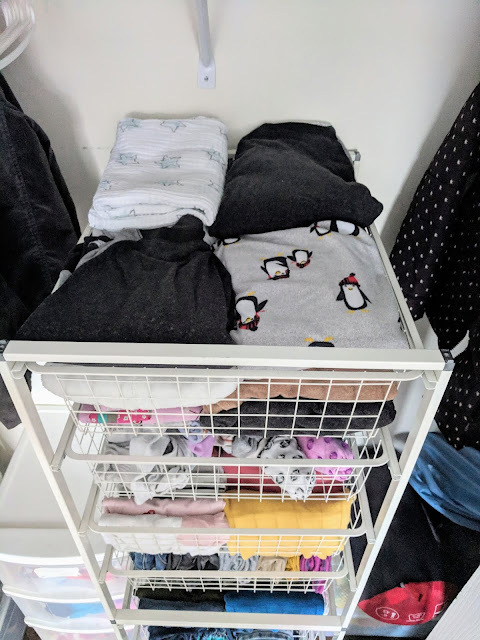 Our kids all share one drawer for their socks and underwear, one drawer for their pyjamas, and they each have two personal drawers; one for tops, another for bottoms. It's not a lot of space, even for a child, but with this new folding it feels like more than enough. I love seeing some new variety in their clothing choices too! And before you think I'm crazy, I promise, this doesn't take more time than regular folding! Seriously it's a matter of folding maybe once more per item, so seconds are added. And surprisingly, the kids haven't destroyed their drawers! In fact, this method seems easier for them to keep tidy than when I used to put folded laundry in stacks. Go figure. Every year I've tried different methods of tracking what I read but I always get lost somewhere in July and the rest is history. I loosely keep track of the thirty or so books I read each year, but I want a better system, so now I'll be doing a quick monthly blog post about the books I've read and my brief impressions. Each month I'll write about the books I've completed that month, which may mean I began them the following month. I also include audiobooks here, even though I still prefer turning real paper pages. Audiobooks are brilliant for people who spend any length of time in transit, commuting to work, running errands, etc. I buy most of my audiobooks from the Daily Deals e-mail which I receive daily from Audible. I'm not actually an Audible member, but you don't have to be to receive their daily e-mails. I'd say once per month they have an excellent classic (such as Jane Austen's Northhanger Abbey narrated by Emma Thompson) for under $5. I also use Christian Audio which also has incredible sales (most books I own from there were $7 or less) as well as a free audiobook every month. You can be a member at Christian Audio, but it's not the route I've taken since their sales are so good. For those who want to make reading a more substantial part of lives, check out this article I wrote last year, Reading for Pleasure + How to Get There. I didn't grow up as an avid bookworm and aside from mandatory texts for my degree and the odd book to grow in my faith, I didn't read, and certainly never just for fun. Everything changed after having Chloe when I found myself with three children under the age of three in desperate need of self care. With so many small children, I was rather house bound, which brought me to the fork in the road between endless television, or cultivating a love for reading. Happily, in the winter of 2014, I picked up a novel, and the first great work of fiction I'd probably ever read (for those wondering, it was All The Light We Cannot See by Anthony Doer). I was hooked. I started reading Jane Eyre in December 2018 with my Book Club and finished it just in time for our meeting on the first week of January. It wasn't my favourite Bronte book but it was still beautiful to read (and listen to - I actually did both simultaneously). 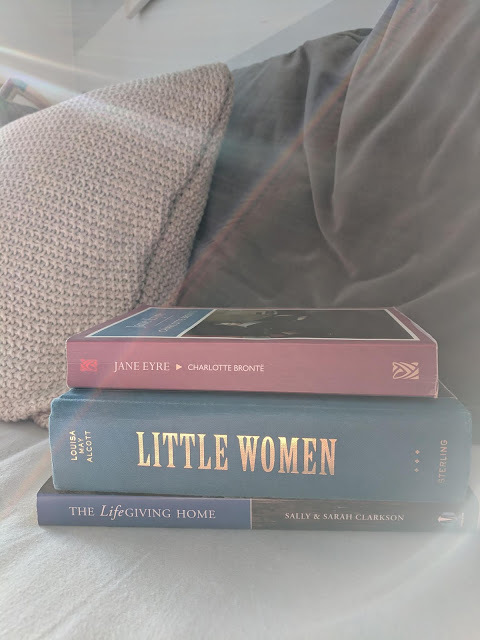 I found Jane hard to like as a protagonist, though I admired her boldness, courage to stick with her convictions, and generosity of spirit even after being so hard done by in her early life. The book pushes the reader to consider how our morals interface with our desires, as in Lord Rochester’s desire to marry Jane, to consider if we might face death as bravely as Helen Burns, and if we could forgive a cousin like John, and for that it’s an excellent book club read (such good discussions!) as well as a thought provoking personal study. I watched the 2011 film before reading the book and have promised myself I’ll never make that mistake again – always always read the book first! I have admired Jackie Hill Perry for a few years and saw her speak in person last summer. I first chose to buy this audiobook on Christian Audio simply because of my respect for the author as a poet and writer, not because of the subject, though she shares her personal story, laced with Biblical truth with incredible depth and beauty. She is best known as a spoken word poet, which made the audiobook an obvious choice as its read by Jackie HillPerry herself. She doesn’t just read, she performs. It’s not just a book, it’s historical biography, profound apologetics, and a theology text book all in one. Highly recommend. I started this book between Christmas and New Years and fell hard, fast, for those charming March sisters. I absolutely loved their antics, which reminded me of Anne of Green Gables, but multiplied by four – Meg, Jo, Beth, and Amy. These characters are so sweet it hurts, but they aren’t one dimensional. They still have great sorrows, taste death, experience jealousy, and require forgiveness. I loved that the book took place over many years and we got to see the girls grow into women, eventually leaving Marmee’s nest for a world of their own. Lily had since read the Jr. Classics version of Little Women and Oli is on the second half of the official version and we all agree – it’s a delight. I rewarded myself with the 1994 film adaptation which was on Netflix over Christmas once I’d finished the book and have to say I was hugely disappointed. Laurie was all wrong, Marmee wasn’t nurturing and warm enough, and many of the best bits were left out. There’s a new movie coming out this year though, so I’m interested to see how it goes! Susie: The Life and Legacy of Susannah Spurgeon, wife of Charles H. Spurgeon by Ray Rhodes Jr. I just finished this book under the wire and really enjoyed it. 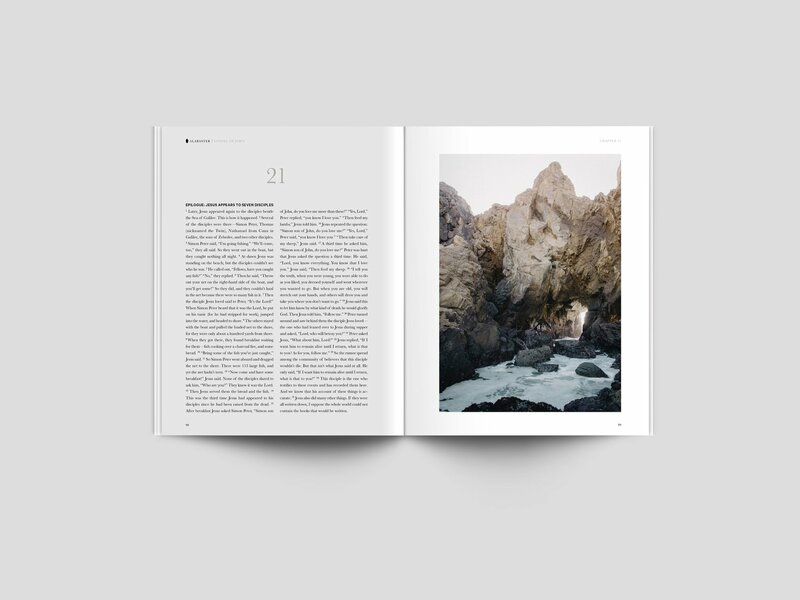 Over all, the book gives a lofty vision for what home can be – a refuge from the world, a place for belonging and becoming. 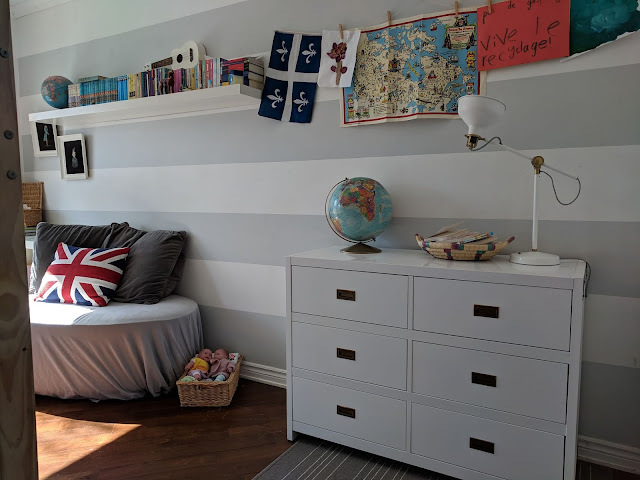 I’m inspired by Sally Clarkson to make my home such a place for our children but also guests, friends, and neighbours. Having read The Gospel Comes With A House Key by Rosaria Butterfield last summer, hospitality has been on my mind in recent months, so this book was a natural choice. 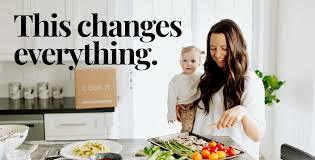 I’ve loved Sally Clarkson’s parenting books over the years, but appreciate how she turns the focus on the home. It’s co-authored by her eldest daughter Sarah, and I found myself especially liking Sarah’s chapters as an adult who lived through a home experience like what’s written about in the book. Some parts of the books interested me less because they were heavy on examples from their home, which in many ways won’t fit with the Morrice family or our rhythms. Clarkson is quick to note that not every example will work for every reader, and that their interests and favourites aren’t prescriptive for the audience, so it didn’t irk me, I just wasn’t underlining those parts very often. I still recommend it and learned a lot!